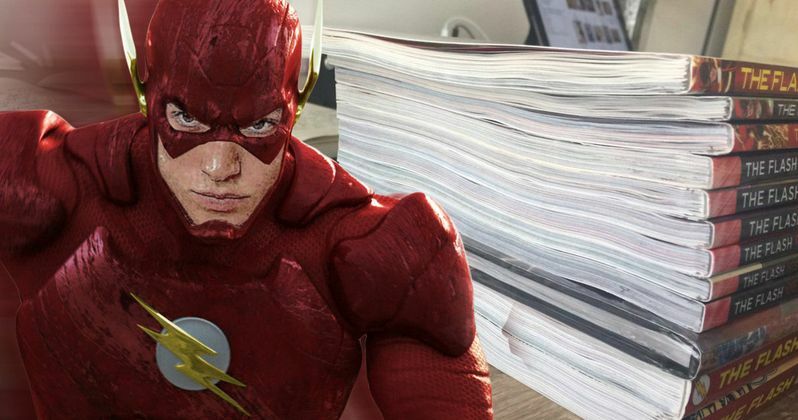 The Flash movie that is currently in development at Warner Bros. has had its fair share of troubles leading up to now. But things seem to be smoothing out a bit. The film recently found a new director in Rick Famuyiwa, who directed the 2015 indie film Dope. He recently took to Twitter to prove that he is taking his job very seriously. The director shared a photo on his Twitter that shows he's doing an awful lot of research for The Flash movie, which will be heading into production some time after Justice League wraps up. Famuyiwa captioned the photo that featured a large stack of Flash trade paperbacks by cleverly saying "Today was a BLUR." Though it wasn't possible to make out every book in the stack, what can be identified is very encouraging. One noticeable title, which is able to be identified thanks to the unique design, is Flash: Rebirth, which was a six issue run written by none other than Geoff Johns, who has of course taken on a role at Warner Bros. to oversee the production on all of the DC Comics movies moving forward. The hefty stack of trades also seems to include some various classic Flash stories and some other recent stuff as well. It is a bit unlikely that Famuyiwa actually read that entire stack of comics in a single day, but the fact that he is already digging in that hard is a pretty good sign. The Flash movie has had some bumps in the road up to now and it looks like Warner Bros. is doing their best to smooth things out. Writer Seth Grahame-Smith was set to make his directorial debut with The Flash, be he recently exited the project and that caused some speculation that there was some more trouble behind the scenes. Some even speculated that James Wan would be exiting Aquaman as well, but that turned out to not be true. In addition, there has been quite a bit of outcry from fans of the Flash TV show who believe that Grant Gustin should be taking his version of the character to the big screen as opposed to Ezra Miller, who will be taking on the role for the film version. Warner Bros. is betting big on their slate of DC Comics movies over the next handful of years, even after the poor reception and under-performance of Batman V Superman. That film was set to launch the DC Extended Universe and though it did, it wasn't quite the home run the studio was hoping for. Warner Bros. has done an awful lot to try and course correct in the aftermath, and it looks like Famuyiwa, for his part, is taking it very seriously, and that should be encouraging for the fans. The Flash is set for release on March 16, 2018.